I don’t use a lot of apps. When I do, it is usually a very short lived phased in which I end up deleting or abandoning it within a couple weeks. My first stop on the process was the App Store. 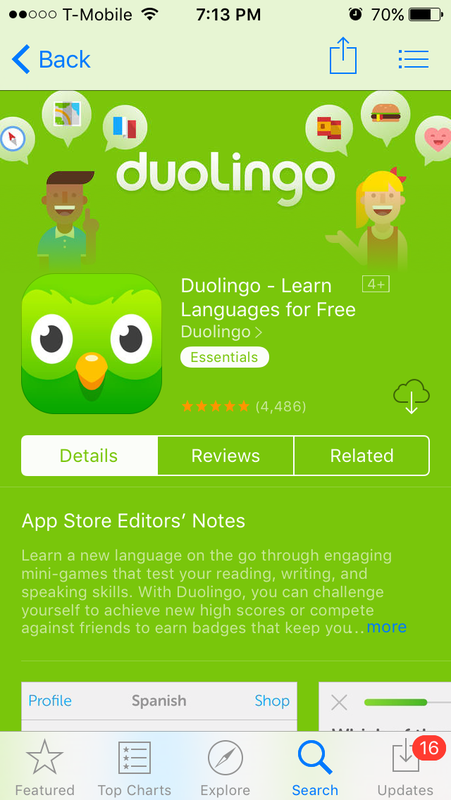 I type in “Duolingo” and I am presented with a nicely illustrated green owl. Following that are 4 words describing their value add, “Learn Languages for Free”. Simple. It tells exactly what their app does and uses the four letter word we all love, Free. Not to mention, the 4,486 reviews which give it a 5 star rating. If other people think it’s great, then it must be right? The professional app icon, well designed app description page, 5 star reviews, simple value add, and the word free all tell me it’s worth clicking the download button. I am not even inclined to read the reviews, I just click “Get”! 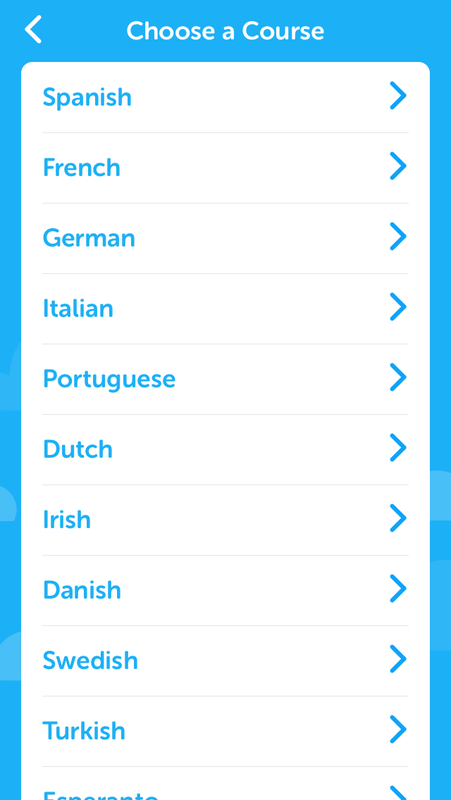 As I open the app I am greeted with the first screen which reads “Duolingo. 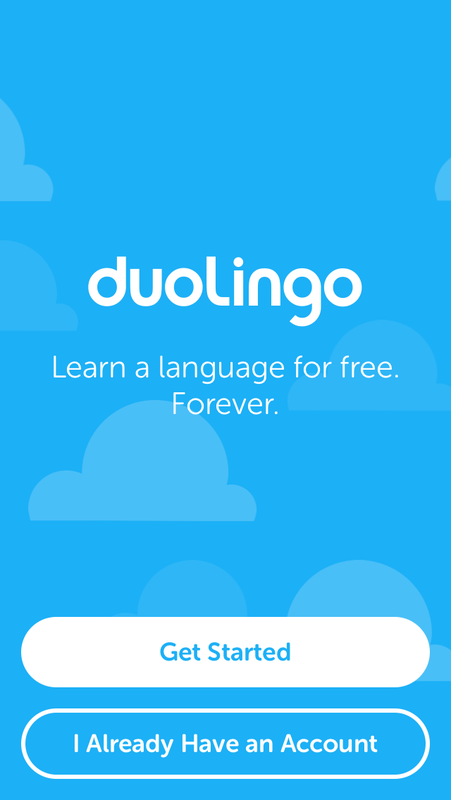 Learn a language for free. Forever.” Wait, what do you mean forever? You’ve gotta ask me for money at some point in this process right? Or maybe its filled with ads and there is an ad-free pro version? Well, lets click “Get Started” to find out. Next is another screen asking me to “Choose a Course”. No Sign Up or register just yet. This is surprising but I am glad I don’t have to type anything in. 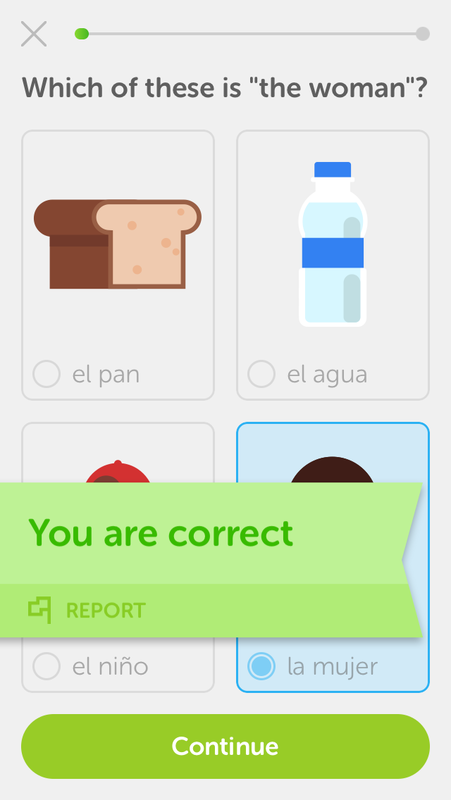 I click Spanish which is at the top of the list. I don’t even have to scroll! Then another screen, asking me to Pick a Goal. 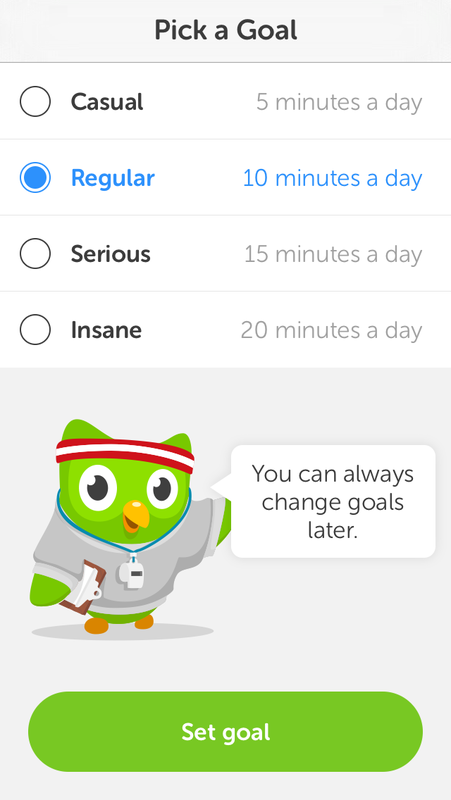 I choose to be a regular user of only 10 minutes a day and am reassured by the cute little green owl that I “can always change goals later”. This takes the pressure off and I no longer feel the need to “go big or go home”. I set my goal and move right along. 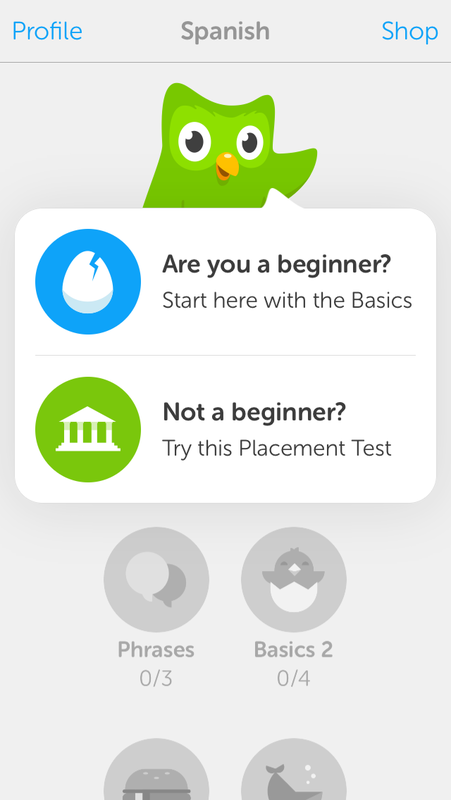 Before starting any lessons, it gives me an option of taking a placement test to see where I am. 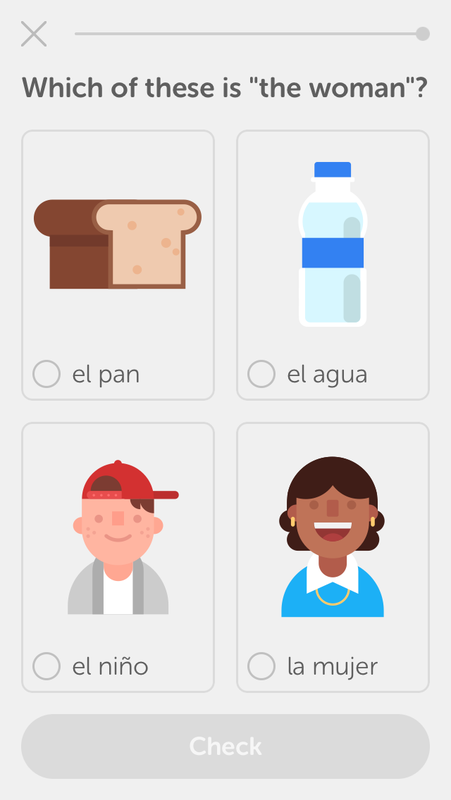 Although I took two years of Spanish in high school, I choose to start with the basics. 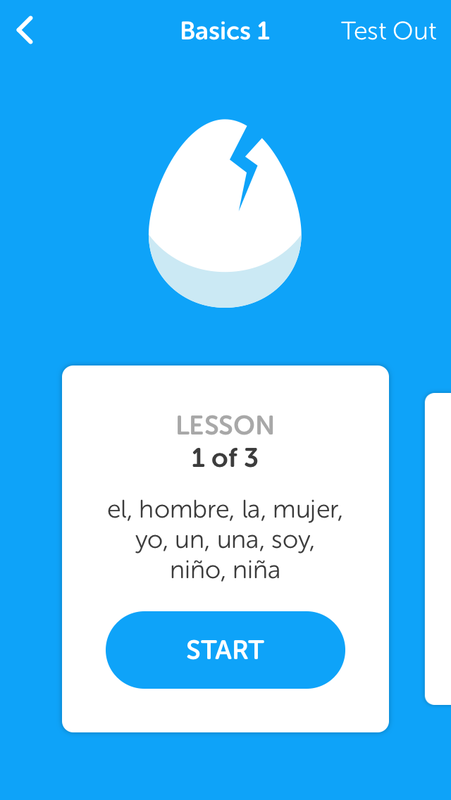 They quickly tell you what you will learn in the lesson and you can click “start”. The first lesson almost feels too easy. They essentially give you the answer but phrase it like a question. You know this, but when you give the answer and it tells you it’s correct, you still feel awesome. When the first lesson is done, I’ve gotten every answer right and learned a lot in the process. 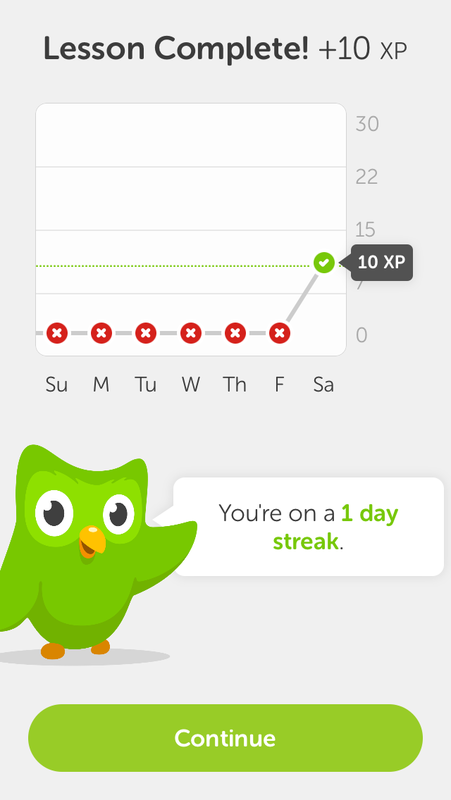 I’ve completed the first lesson and can see how my awesome level increased today with points on a simple graph. Day 1 done and I am on a roll! I wanted to keep going, and I did. There it is! The registration screen. Only they don’t call it that. 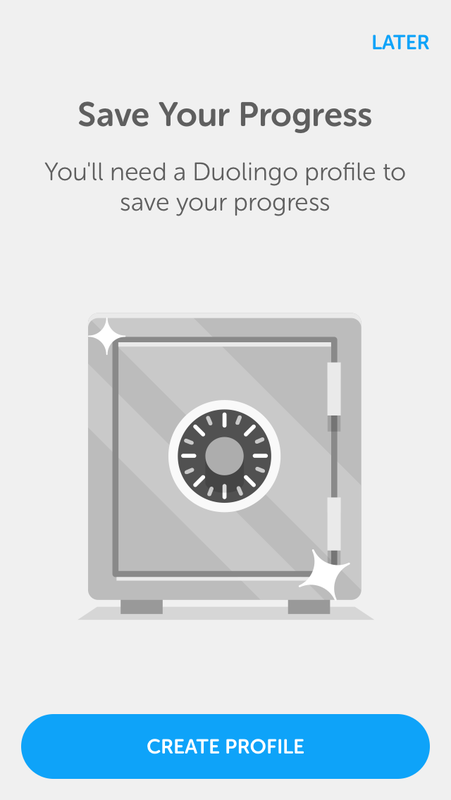 I am nicely told that in order to save my progress I need to “Create a Profile”. It makes sense and everything was easy up to this point, so I do. Preeeeesenting! 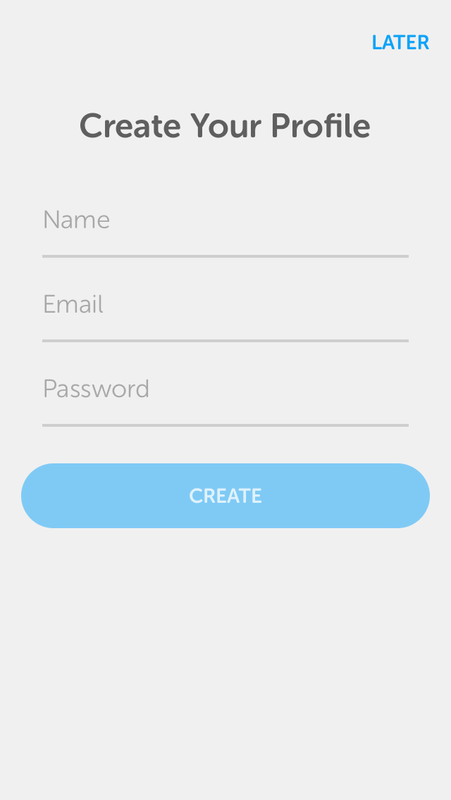 The simplest registration screen I have ever seen! I typed in a name, my email and a password. No complaints about it being weak or not long and complex enough. It works and I go right on to lesson two. It’s seamless! Oh! One more thing. During the lesson they provided one tool tip that told you to click on highlighted text for tips and explanations. 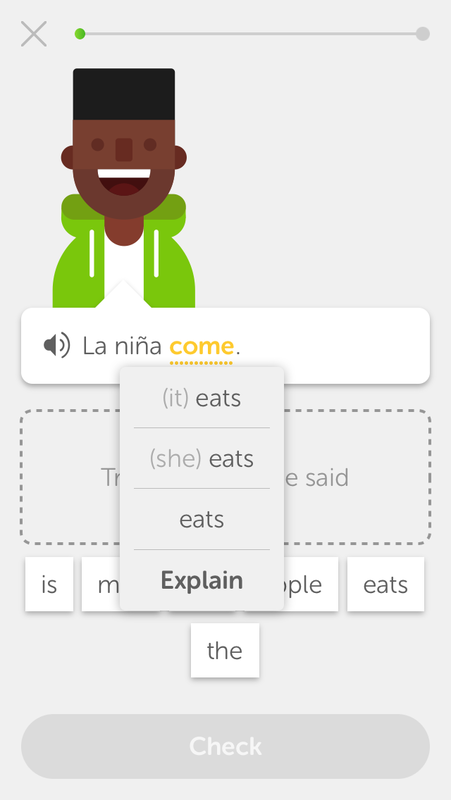 That was all the explaining need to learn to use the app. The process is seamless, no scrolling, just one tap per screen and not too many options and you are well on your way. You get to experience a whole lesson before they ask for any information and when they do its the easiest process ever. 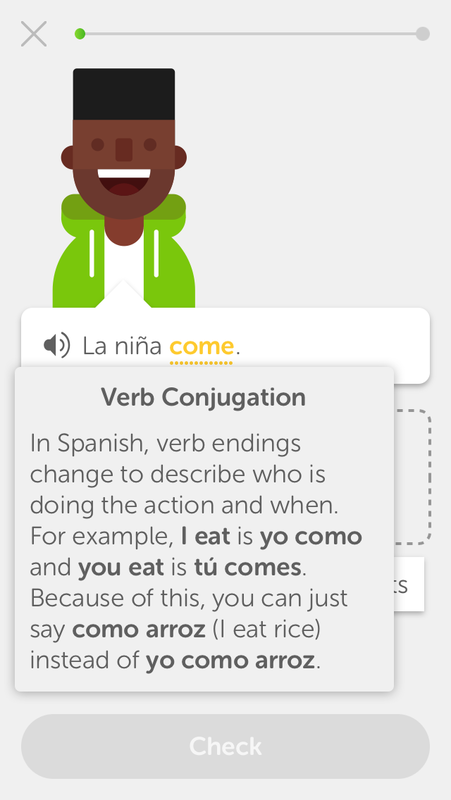 This app is great because it gets you right into the lessons. 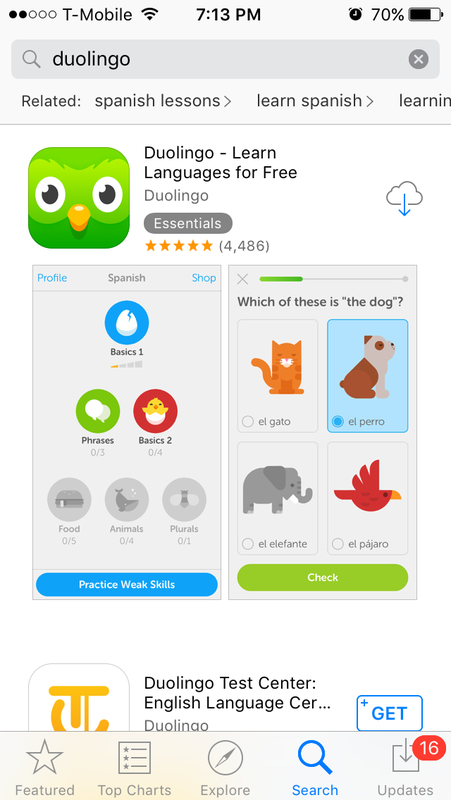 After downloading, you are in the app learning a language and feeling awesome within a minute. The best part, it really is free forever. Their business model is genius!